capturing and processing the electrical signaling (data), acquired by another channel of information associated to one or more sensors, that follows the Trigger Event2. In what framework do we have to consider the basic measurement process we name Triggering, classic or modern? It was established long time ago that Events happen in a Quantum Field and that several results are associated to the multitude of configurations in which the measurement process is defined in the Hilbert space. There, all possible results of the measurement (Triggering) coexist. On the opposite, in the special branch where we are, it is perceived a single eigenvalue. The discovery of Decoherence cleared why the multiple coexisting results of measurements, named superpositions or pure states, being of extremely brief duration are impossible to perceive for Us. However detected when using special instrumental arrangements like, e.g. during simple experiments of Quantum Optics involving the same identical beam splitters today universally present into camera-equipped Empty and Full Bottle Electronic Inspectors. This modern point of view was born in 1957, tailored since the start on an ideal device whose components and functions are a photocopy of that subset of the Binary Classifiers named Electronic Inspectors or, Bottling Controls. In the following, it'll be shown the fine detail of the Triggering sequence as today it is considered be happening. “Hilbert space represents a system before the measurement"
Because all others get damped out by Decoherence, before we have the time to observe them. did not happened (one result). which makes the Event a unique label for a single instant of time in an alternative history. When t = 14.07.2009 13:04 the neck of a bottle is present along the trajectory of the LASER beam of light. When t = 14.07.2009 13:04 the neck of a bottle is not present along the trajectory of the LASER beam of light. When t = 14.07.2009 13:04 the LASER beam is not present. The neck of the bottle lies, from the point of view of the Electronic Inspector, in an undefined status: no information to discriminate if it is present or not. To that instant of time are referred a multitude of additional results different than those three. Each result being an Event triggered with different properties. Why a multitude? The answer, explained with plenty of details elsewhere in this web site, is based on the modern understanding of what can be directly and easily witnessed making use of Mach-Zehnder interferometers, invented over one century ago. These are devices based on a couple of beam splitters like those extensively used in the camera-equipped Full and Empty Bottle Electronic Inspectors illuminated by LASER light. Another today common ingredient of all Full and Empty Bottle Electronic Inspectors in the beverage bottling lines. The branch “No measurement” is that one where (lowest shot in the sequence of photos above) the system configuration allowing measurement was not fulfilled (in our case, no LASER light). fully described in a complex-valued subset of the state space (an extremely simple example of it in the figure at right side), named Hilbert space. The shape of its distribution we perceive in terms of a Probability for the different results of the Triggering operation. The results suggested by these three cases shall be examined one-by-one in the table below in terms of their sharpness, answering an intuitive question: in what a way is it distributed the information about the status of the presence of the bottle? This way to synthesize the conditions of what we name Signals, is common thru all Electronics. An example appears in the following diagram, showing a power spectrum analysis with the frequencies on the horizontal axe in the range of frequency (0 - 200) MHz. On the vertical axe, signals’ intensities are scaled in decibel, and range from a minimum of -100.0 dBm (0.1 pW, in SI units) until a maximum of 0.00 dBm (1 mW, in SI units). Displayed four prominent Signals between hundredths others. Only those four whose frequencies are: (0, 50, 100, 150) MHz, emerge by the background noise. The power amplitude of the signal marked in yellow colour 1, peaking at the coordinates (50 MHz, 0.00 dBm) is the reference to scale all of the others. Background signals range: (-75 dBm; - 85 dBm), around 10 pW only, say ~10-8 times less powerful than the Signal 1.
read all of the available data, then we’d get another notification when data became again available for reading. Edge Trigger bandwidth is another relevant detail of this process. The Edge Trigger chip’s comparators will only work until reaching a certain frequency. If the frequency of the signal exceeds the Edge Trigger bandwidth, the Edge Trigger will not Trigger at all, even though the signal passed both thresholds. That’s due to the timing between the comparator: if the signal passes too fast, the Edge Trigger will know that a signal crossed one threshold, but will not be fast enough to know if the second one was crossed. This is one of the problems visibly affecting, in the crude practice, all of the Bottling Controls not operating standalone, rather with synchronisation sensors or inspections in-the-Machine. Machine being a Filler, or Closer or Labeller. Here, no one way exists to increase the sensitivity of the digital Inputs where these signals are wired for later processing in nor for the most common critical cases of Triggering. Bottle Burst inspection in-the-Filler Machine, where a set of synchronisation sensors (Filler Synchronisation, Machine Cycle) cooperate with two inspections (Bottle Burst and Container Presence) to determine the eventual presence of extremely dangerous glass splinters in bottles filled adiacent to an exploded one. A solution to this problem is commonly met, on the opposite, in the commercially available oscilloscopes, where the Trigger Sensitivity can be adjusted to the special conditions in which measurements have to be performed. Here the Trigger Sensitivity is specified to accelerate the Edge Trigger bandwidth. Trigger Sensitivity specifies how large the signal needs to be at certain frequencies in order for a chip to Trigger. The larger the signal, the easier it is for the Edge Trigger to work and, hence, the faster the Trigger can function. there would be two more (rising) Level Triggered Events in the trace, though no more (rising) Edge Triggered Events. failure, implying a permanently open circuit, of the switches and connectors part of the Signal's circuit. 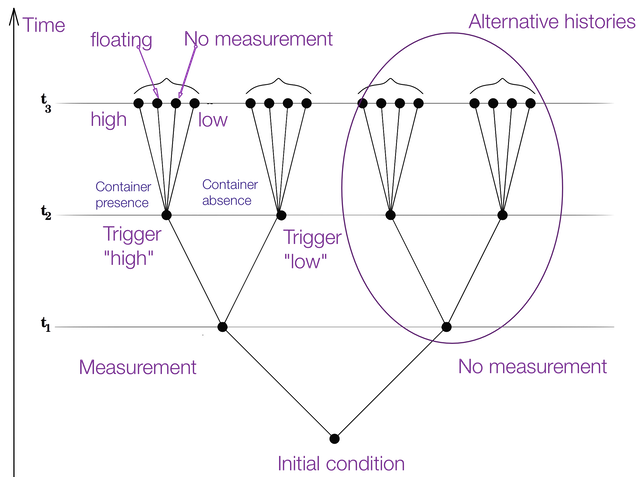 Comparing Edge Triggers and Level Triggers, because of what detailed above, Edge Triggered Events tend to be more stable than Level Triggered Events. What examined before becomes relevant when applied to the special case of the Food and Beverage Bottling Lines Machinery where the Triggers of the Electronic Inspectors operate. Here, hundredths of motors simultaneously running and frequency converters, add an important contribution, widening the spectrum of frequencies of the signals travelling along the conductors where Trigger sensors, photo-sensors or inductive-sensors are connected to the Inspectors’ IO circuits. Our Triggers live in a noisy Environment. An example of this in the Figure on left side, representing the same Trigger signal as seen in two different places of a circuit processing. Today, the IO gate circuitry of the Electronic Inspectors is still mainly based on TTL logic, but however moving toward the CMOS standard. (2.00 - 5.25) V for a High logic state. The voltage levels guaranteed by the manufacturers over a specified range of load conditions range from 0 V to 0.5 V for a Low logic state, and 2.7 V to 5 V for a High logic state. If a voltage signal ranging between 0.8 V and 2.0 V were to be sent into the input of a TTL gate, there would be no certain response from the gate. Such a signal would be considered uncertain, and no logic gate manufacturer would guarantee how their gate circuit would interpret such a signal. instead of 5.0 V. The fabrication technology itself is different for 3.3 V devices, allowing a smaller footprint and lower overall system costs. In order to ensure compatibility, most of the voltage levels are almost all the same as 5 V devices. A 3.3 V device can interface with a 5 V device without any additional components. For example, a logic “High" from a 3.3 V device will be at least 2.4 V. This will still be interpreted as a logic "High" to a 5 V system because it is above the VIH of 2 V.
When interfacing from a 5 V to a 3.3 V device it results necessary to ensure that the 3.3 V device is 5 V tolerant, say that the maximum input voltage is equal or superior to 5 V. On certain 3.3 V devices, any voltages above 3.6 V will cause permanent a damage to the chip, making mandatory at least a voltage divider (e.g., a 1KΩ and a 2KΩ) to reduce 5 V signals to 3.3 V levels. The tolerable ranges for output signal levels are narrower than for input signal levels. This way, it becomes possible to ensure that any TTL gate outputting a digital signal into the input of another TTL gate will transmit voltages acceptable to the receiving gate. The difference between the tolerable output and input ranges is called the noise margin of the gate. For TTL gates, the Low level noise margin is the difference between 0.8 V and 0.5 V (0.3 V), while the High-level noise margin is the difference between 2.7 V and 2.0 V (0.7 V). In other words, the noise margin is the peak amount of spurious voltage that may be superimposed on a weak gate output voltage signal before the receiving gate might interpret it wrongly. The margins for acceptable High and Low signals may be greater than what is shown in the previous illustrations. What is shown represents worst-case input signal performance, based on manufacturer's specifications. In practice, it may be found that a gate circuit will tolerate “High" signals of considerably less voltage and “Low" signals of considerably greater voltage than those specified here. Conversely, the extremely small output margins shown, guaranteeing output states for “High" and “Low" signals to within 0.05 volts of the power supply variations are optimistic. It is the amount of loading to really define if these output voltage levels will be true or not. If the gate is sourcing or sinking substantial current to a load, the output voltage will not be able to maintain these optimum levels. Within the "uncertain" range for any gate input, there will be some point of demarcation dividing the gate's actual “Low" input signal range from its actual “High" input signal range. That is, somewhere between the lowest “High" signal voltage level and the highest “Low" signal voltage level guaranteed by the gate manufacturer, there is a threshold voltage at which the gate will actually switch its interpretation of a signal from “Low" or “High" or vice versa. For most gate circuits, this unspecified voltage is a single point. In the presence of AC noise voltage superimposed on the DC input signal, a single threshold point at which the gate alters its interpretation of logic level will result in an erratic output. To solve the problem presented by noisy inputs they can be applied Schmitt trigger gates to each one digital input of the Bottling Control. Schmitt trigger can be considered a comparator with hysteresis (see figure on left side). Their main feature is to ignores high frequency noise in their threshold voltage. Noise below the threshold is ignored (see figure on left side, below) and positive feedback latches the output state until the opposite threshold is exceeded. The output is slew-rate limited by the operational amplifier response. Considering how noisy the Food and Beverage Bottling packaging Line Environment is, this solution should have to be used as a minimum requirement before to buy an Electronic Inspector. Schmitt triggers are distinguished in the schematic diagrams by the small hysteresis symbol drawn within them (see figure on left side, above). An hysteresis due to the positive feedback within the gate circuitry, adding an additional level of noise immunity to the prerformance of the gate. Also remarkable the fact that TTL inputs automatically assume a “High" state when left floating.